An Australian author imprisoned last month for insulting the king and crown prince of Thailand was on his way home Saturday after receiving a pardon from the king. Harry Nicolaides, 41, was arrested last August over his 2005 book titled “Verisimilitude.” The book includes a paragraph about the king and crown prince that authorities deemed a violation of a law that makes it illegal to defame, insult or threaten the crown. CNN has chosen not to repeat the language because it could result in CNN staff being prosecuted in Thailand. Mark Dean, a lawyer for Nicolaides, said he was released Friday and taken to the Australian embassy in Bangkok, where he stayed until leaving for Australia at about midnight. “He is obviously very relieved and grateful that the pardon was granted,” Dean said. Nicolaides was sentenced to three years in prison after pleading guilty last month. He faced a term of up to six years before the plea. Watch shackled Nicolaides at court » His lawyers then requested the pardon. King Bhumibol Adulydej had pardoned foreigners in similar cases in the past. 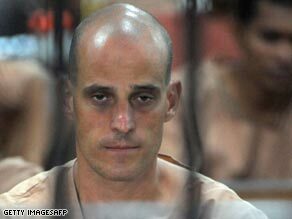 Dean said Nicolaides was deported from Thailand, but that he did not know of any other stipulations related to the pardon. In an interview with CNN International, Dean avoided repeating what Nicolaides wrote, but said the passage was presented as a rumor, not a fact. “This is probably not the best time to repeat the passage that was found to be offensive,” Dean said. “But it concerned the crown prince of Thailand and a rumor that was being circulated in Thailand about the crown prince.” Nicolaides had been living in Thailand since 2003, lecturing at two universities about tourism. He was about to leave Thailand when he was arrested on August 31. It is not clear why the authorities waited three years after the publication of his book to bring charges against him. Fifty copies of the book were published, and only seven were sold. Thailand’s king is highly revered in the Buddhist nation. But even he has said in the past that he can be criticized. Thailand’s prime minister, Abhisit Vejjajiva, also has told CNN he is concerned about what he called misuse of the law. Still, other cases of violating the law are pending before the Thai Criminal Court, involving both Thais and foreigners.